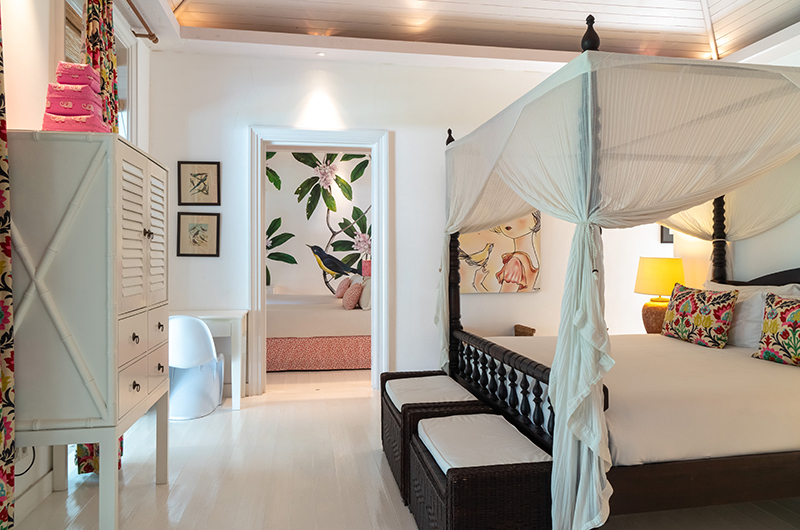 The Cotton House brings you to the trendy heart of Bali’s most sought-after neighbourhood, Seminyak. Ideally positioned between Eat Street and Jalan Petitenget (hello, Potato Head Beach Club! 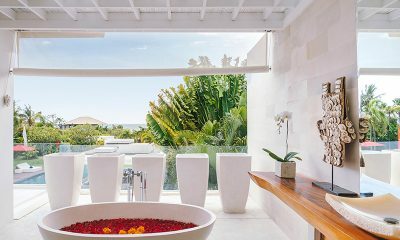 ), this luminous white villa allows you to experience the best of Bali without sacrificing one inch of luxurious privacy. 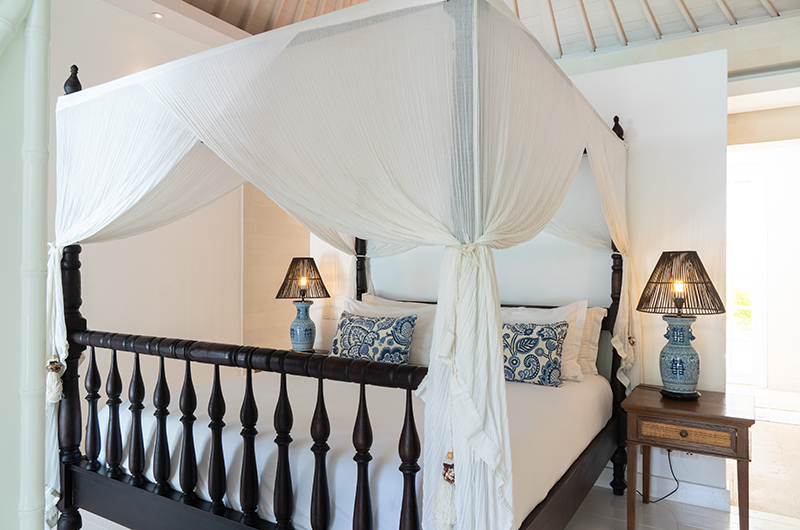 The Cotton House is spread over vast gardens and divided into multiple pavilions, allowing you and your entourage to really spread out and experience Bali in style. And there will be more than enough room for everyone, as this palatial villa offers a whopping eight bedrooms! 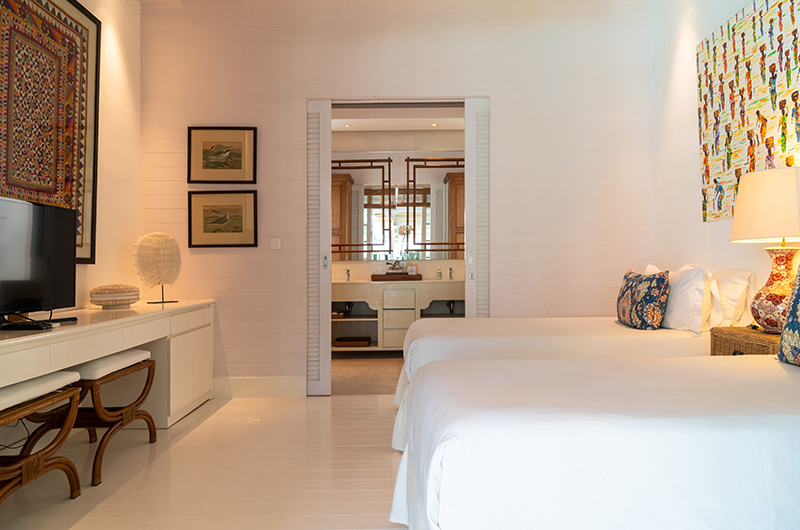 True to its name, The Cotton House is beautifully styled with luminous white hues and whimsical details – there’s even a vintage rocking horse in one of the bathrooms. Our team stayed here – read more about our epic stay in The Cotton House. Book less then 10 days prior to arrival and receive 17.5% off. Valid with no other specials. 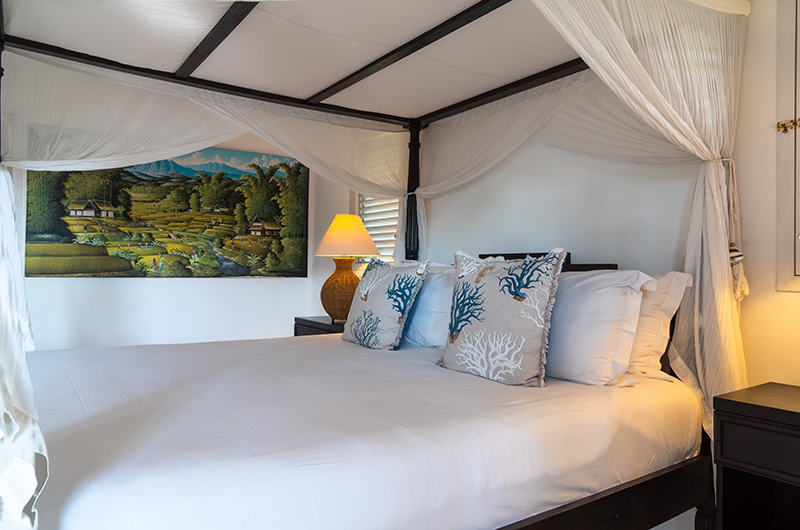 Book 10 nights or more and receive 10% off. Excluding peak season. Valid with no other specials. 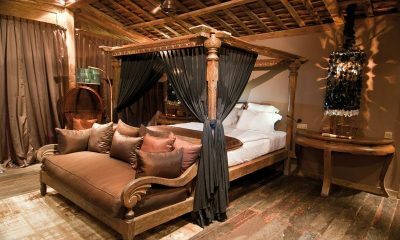 Though The Cotton House is located in the heart of Seminyak, the villa feels like a calm oasis far away from the crowds. 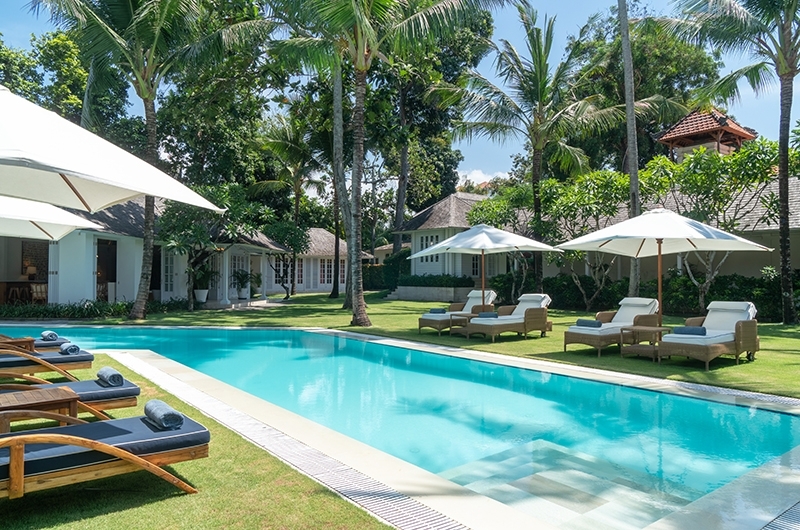 Spread over generous gardens and divided into four pavilions, the villa offers the ideal tropical playground for large groups looking to explore Seminyak. 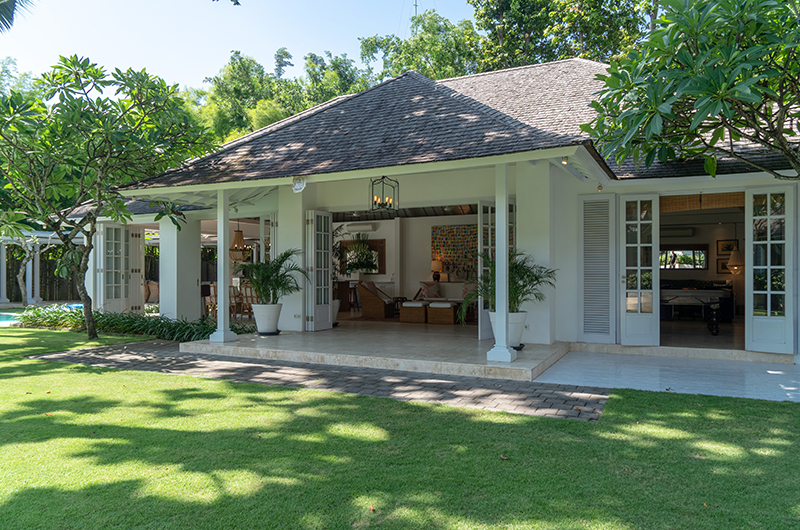 Thanks to the villa’s generous layout, The Cotton House includes three separate living areas divided into their own pavilions. The first one is located in the main building and houses generous seating, a TV and a pool table. 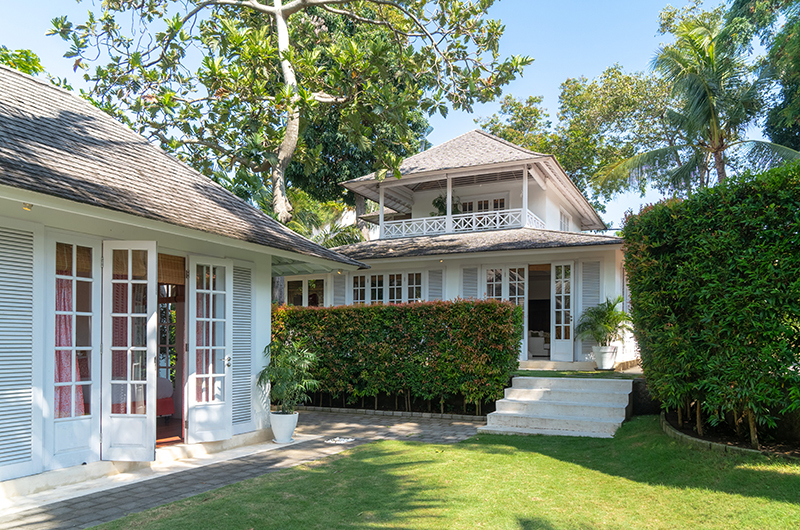 Another lounge is housed in the pavilion housing five bedrooms and a third one adjoins the fourth pavilion which includes two more bedrooms. The Cotton House offers several options for dining in style. 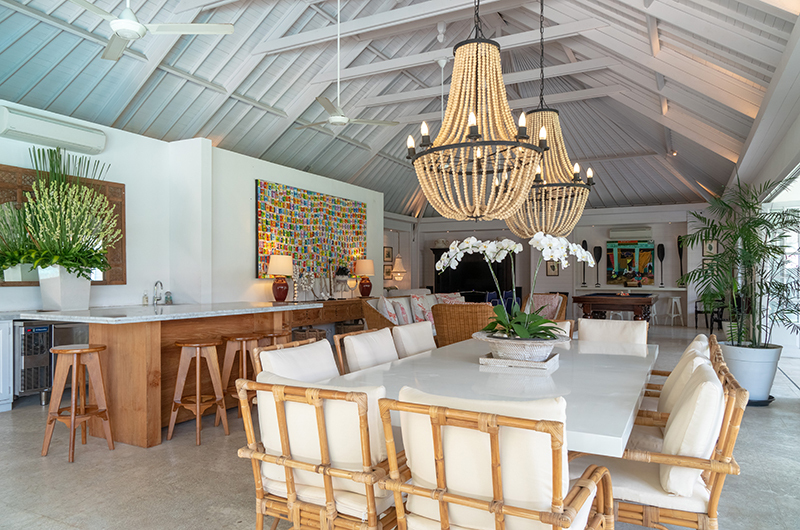 The main living pavilion houses a generous dining table and the same pavilion also includes the villa’s kitchen. There is also an outdoor dining table close by, with direct views overlooking the pool and garden. 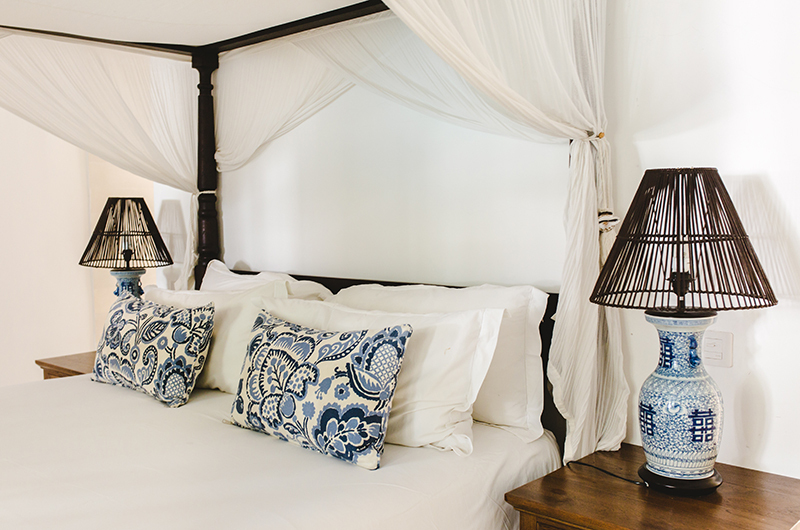 The Cotton House has a beautiful 108m2 swimming pool lined by the villa’s signature white sun loungers and parasols. 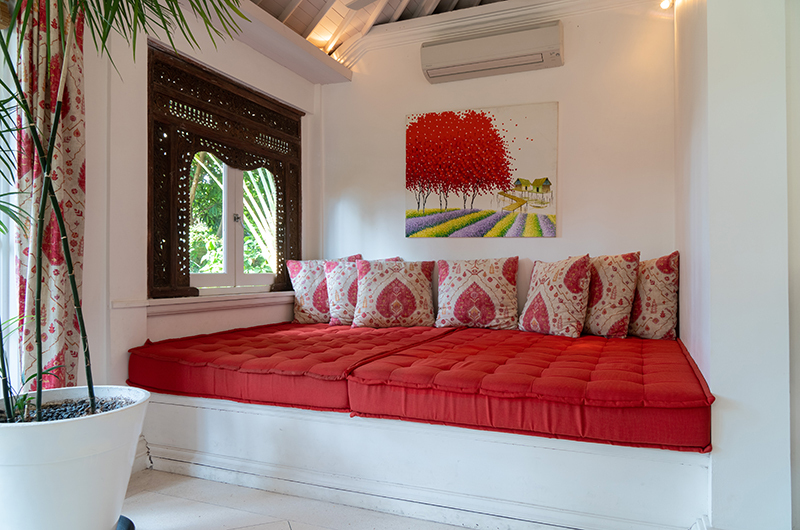 The Cotton House is set amidst generous gardens with vast stretches of lawn that are perfect for fun and play. 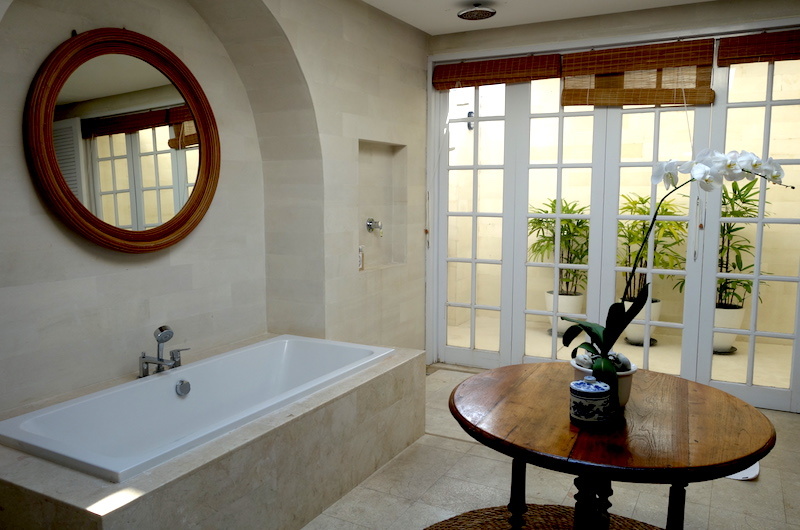 The villa also has a smaller plunge pool which adjoins the two-storey bedroom pavilion. The Cotton House has eight bedrooms. Four rooms have king-sized beds and four rooms have two single beds which can also be set up as a king-sized bed if needed. There are five bedrooms housed side by side in one pavilion and one bedroom is housed in its own pavilion. Two rooms are housed on either floor of a third pavilion. The first bedroom is housed in the same pavilion with bedrooms 2,3,4 and 5. This room has two single beds which can also be set up as a double bed if needed. The room has an ensuite bathroom with an indoor and outdoor shower. 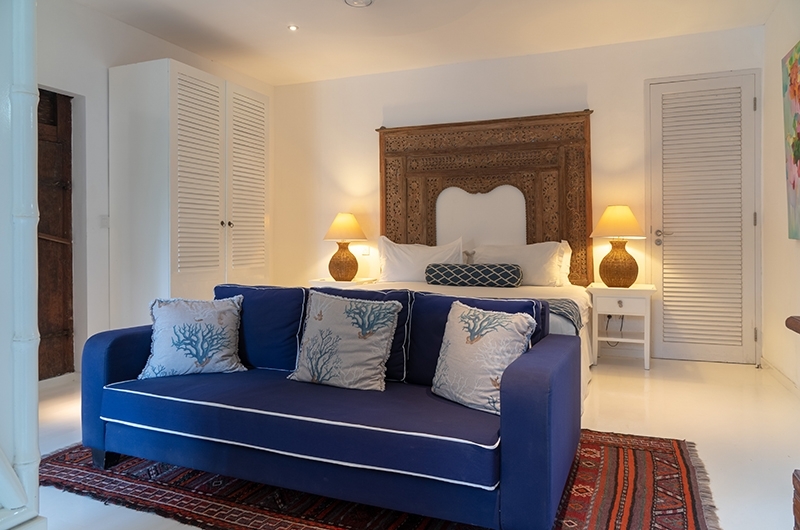 The second bedroom is furnished with a king-sized bed and adjoined by an ensuite bathroom with a shower. 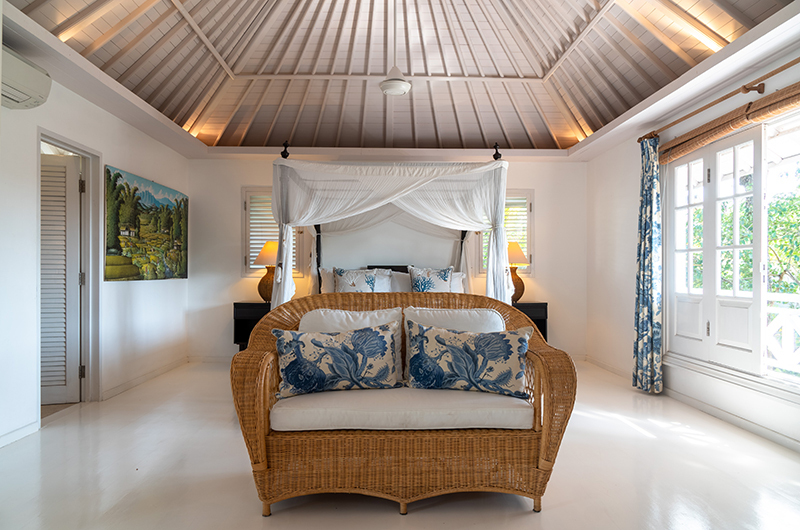 The master bedroom is furnished with a king-sized bed and adjoined by an ensuite bathroom with a bathtub and shower. 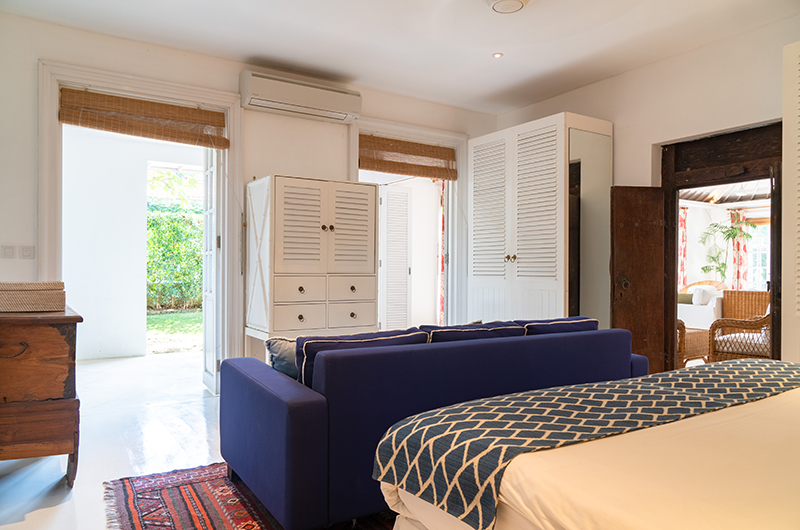 This room has an interconnecting door to the living room which in turn connects to bedroom 4. The fourth bedroom is furnished with a king-sized bed. This room interconnects with the living room and bedroom 5 and is adjoined by an ensuite bathroom with a bathtub and shower. 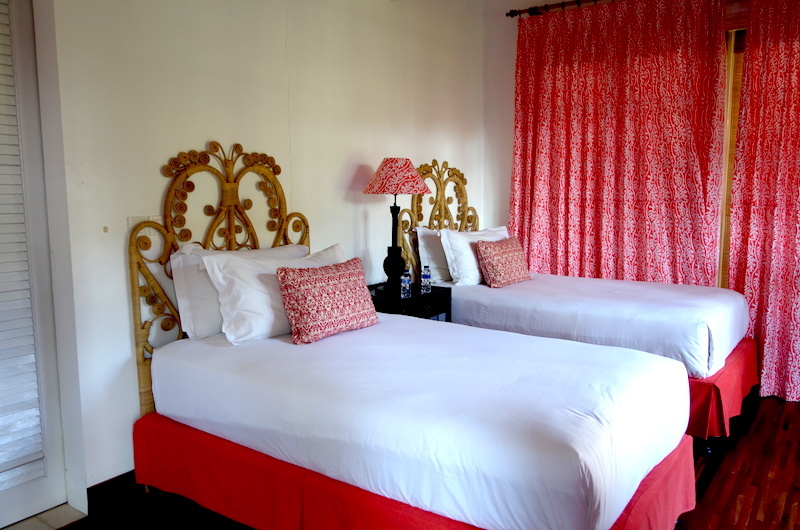 The fifth bedroom is furnished with two single beds which can also be set up as a king-sized bed. The room interconnects with bedroom 4 and comes with a shower ensuite. 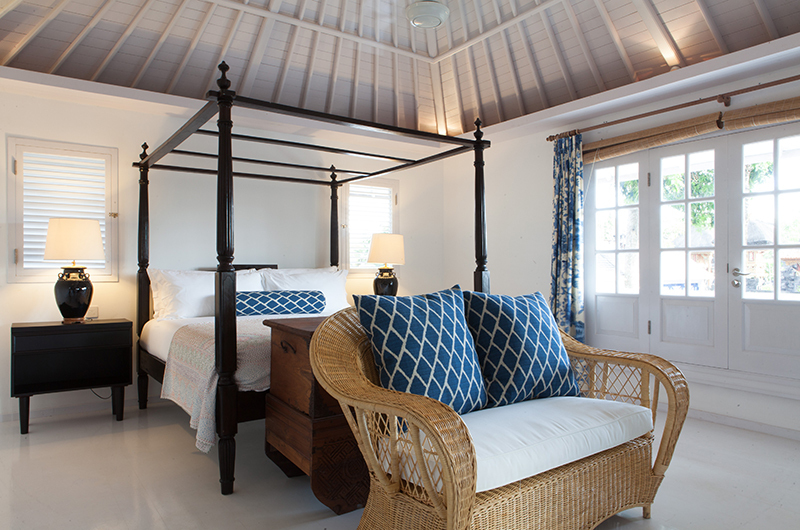 The sixth bedroom is located in the same pavilion with bedroom 7. This room has two single beds which can also be set up as a king-sized bed if needed. 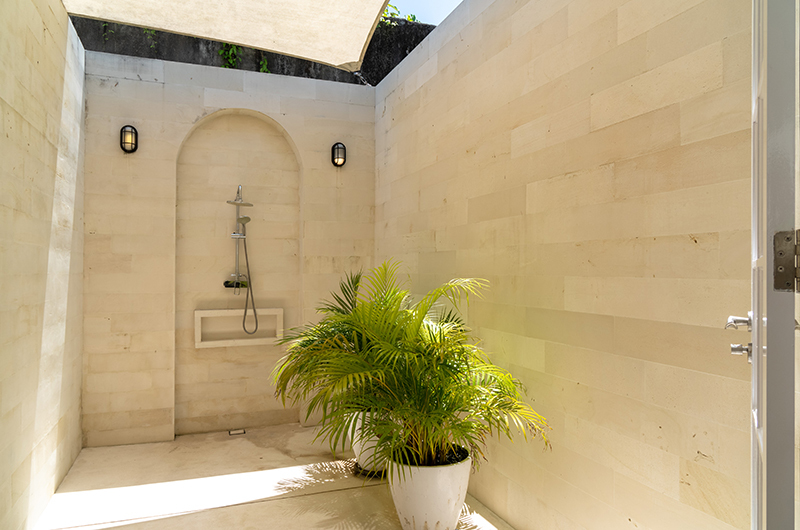 The room has an ensuite bathroom with an indoor shower and a plunge pool. 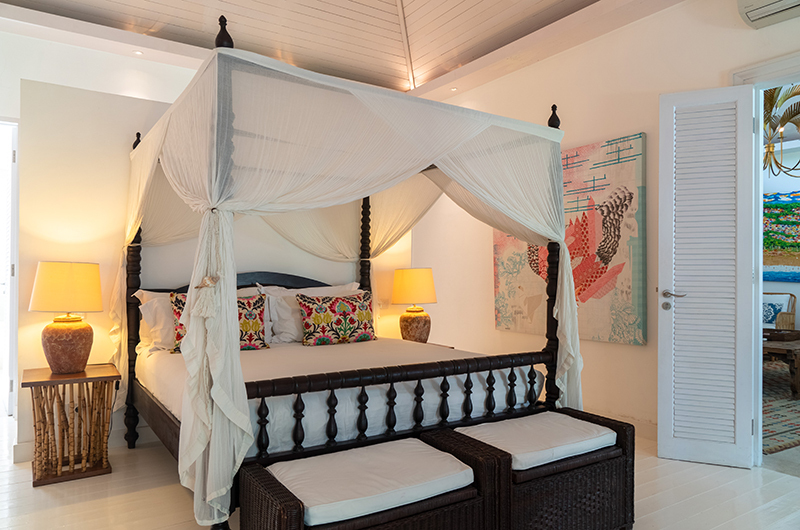 Located above bedroom 6, the seventh bedroom has a king-sized bed and an ensuite bathroom with an indoor shower. 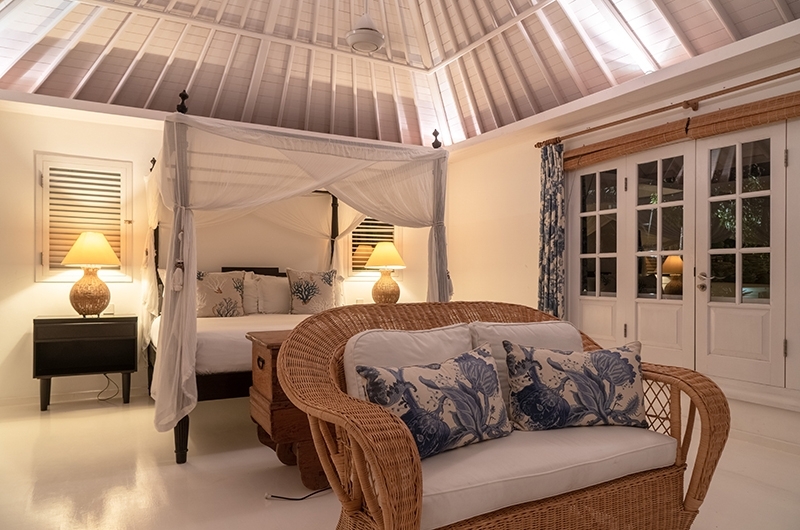 The eight bedroom is housed in its own pavilion and comes furnished with two single beds which can also be set up as a king-sized bed if needed. This room has an ensuite bathroom with an indoor shower. 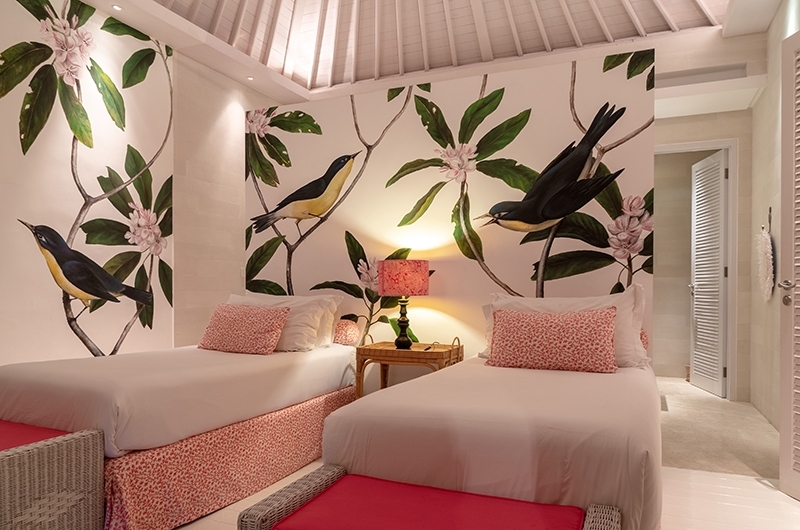 The Cotton House is an eight-bedroom villa that’s divided into four pavilions. 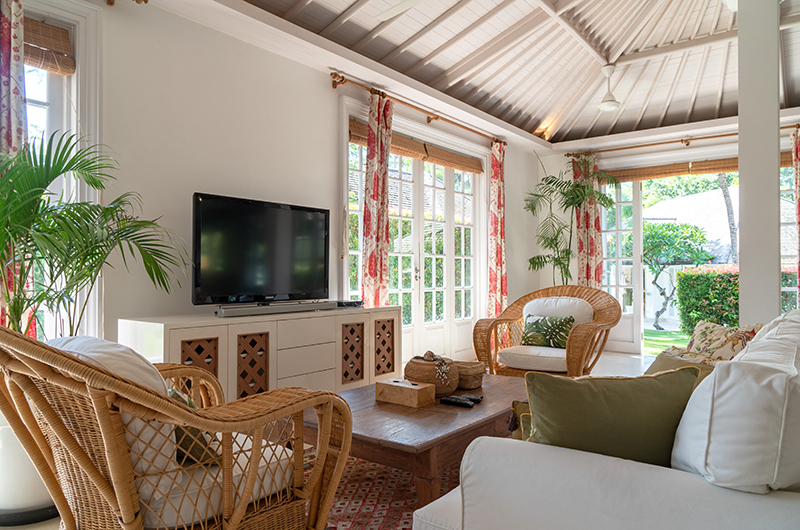 The main living pavilion includes the living and dining areas and the villa’s kitchen. 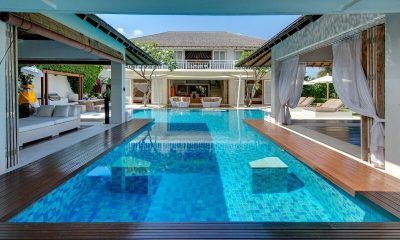 To the left on the other side of the pool is a pavilion with five bedrooms and its own living and dining area. To the right of the first pavilion is a building with one bedroom. Next to this building is the fourth pavilion which houses a third living and dining area and two bedrooms, one on each floor. Your stay in The Cotton House is made enjoyable by the professional staff. 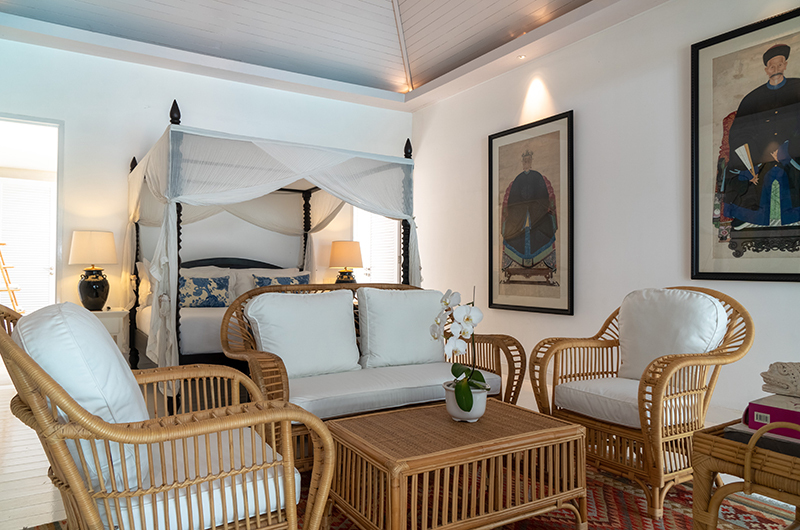 The Cotton House’s staff have been professionally trained and will do their utmost to please with their warm and friendly Balinese hospitality. 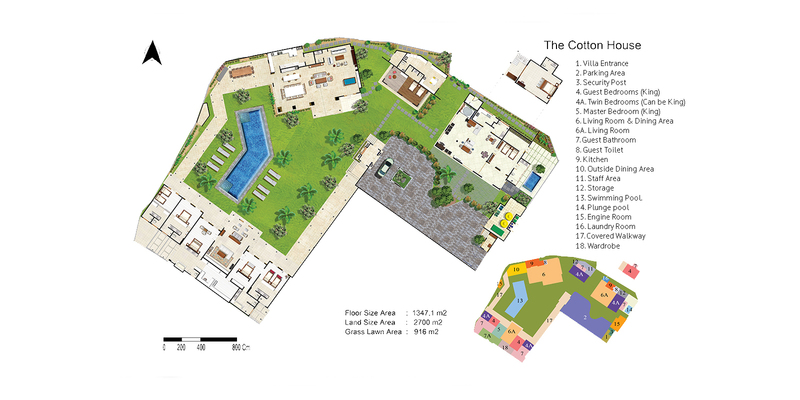 The Cotton House’s experienced and knowledgeable manager is responsible for the overall operation of the villa. The villa manager will oversee and coordinate the staff and property and assist you during your stay. Butlers are on hand everyday to assist with serving during meal times and attend to other guest requirements throughout your stay. Butler service is available between 7am – 10pm. The Cotton House has a full time chef. The wonderful thing about having your very own personal chef is they will cater to your needs and dietary requirements. Daily breakfast will be charged at cost price plus 20% in the same way as lunch and dinner is charged. These additional charges will be informed to the client on a regular basis as they require and will be charged at the end of their stay by way of cash, credit card or T/T as per the current arrangements. A chauffeur will provide you with the ultimate experience! A car and driver can be a great way to explore you holiday destination. 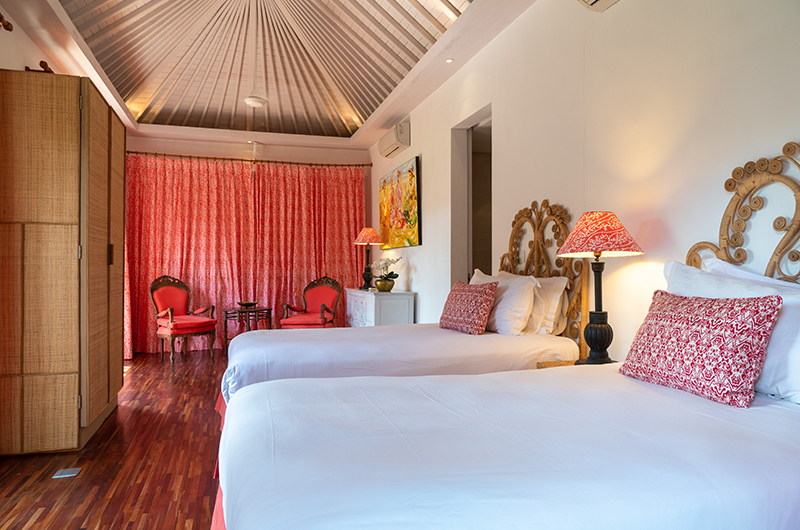 Villa rates include a seven-seater Toyota Innova car and driver on stand-by for up to eight hours of complimentary guest use (excluding petrol). Valid only for bookings of seven or more bedrooms. 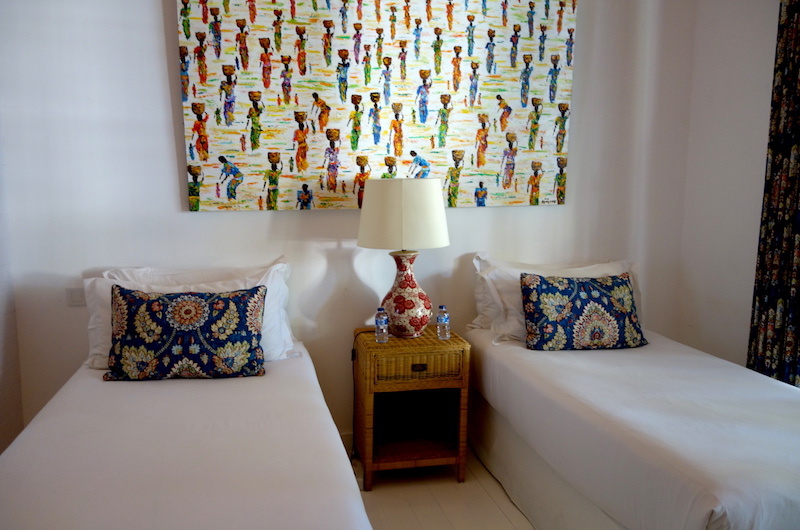 The Cotton House is centrally located in the trendy Seminyak neighbourhood in Bali, Indonesia. 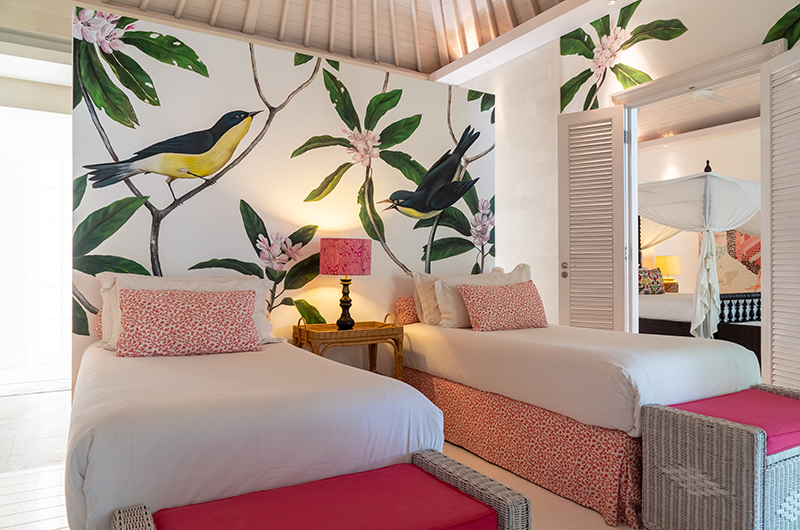 The villa is ideally positioned in a peaceful lane between Seminyak’s famous Eat Street and Jalan Petitenget, which is home to Potato Head Beach Club, The W and countless restaurants. You can reach both streets in a about 10 minutes on foot. Petitenget Beach is about 20 minutes away on foot or under 10 minutes by car. The Cotton House is located about 30 minutes from the airport. Amazing Villa, perfect setting for our whole family to celebrate my husband’s special birthday! Grandchildren ranging from 2 -14 years loved the pool, the lawn area, the pool table and the ability to order their favourite breakfast from the ever smiling staff. The Chef was amazing, producing delicious food every night. The Villa was spotless and cleaned daily as were the grounds, there was never a leaf out of place! The manager Mel was very helpful in suggesting different places for day trips. Highly recommend staying here for your next Bali vacation, we are planning our next trip!! Our extended family of 14 stayed at The Cotton House and could not have been happier. 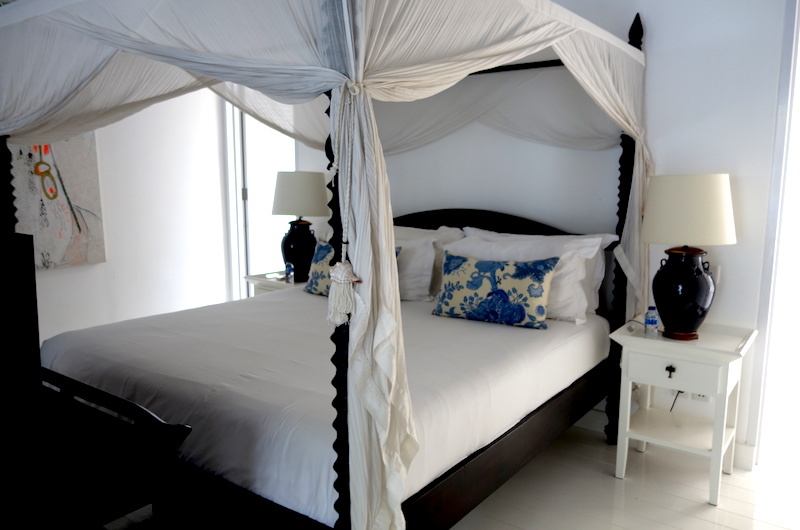 Each room is beautifully appointed, the grounds are lovely, and the staff are fabulous. So helpful and friendly and the meals & cocktails prepared by them were 5 star! It was the most fantastic holiday and the kids keep begging to go back to The Cotton House. The whole of The Cotton House was incredible, and I really thought one of the highlights was the pool at night!! It looked like a dance floor, deep blue and perfect stillness. 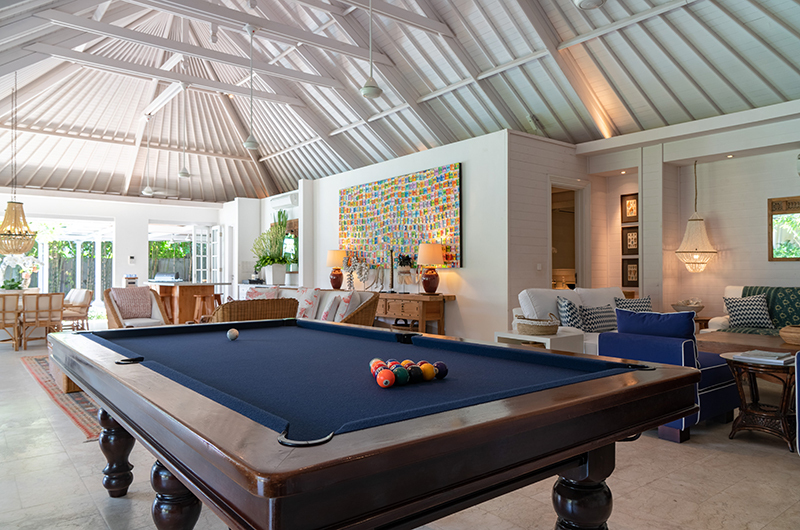 The living room was neat, well thought out, and very spacious, all just right for an evening get together, with the snooker table placed in a convenient spot added the fun element to it. 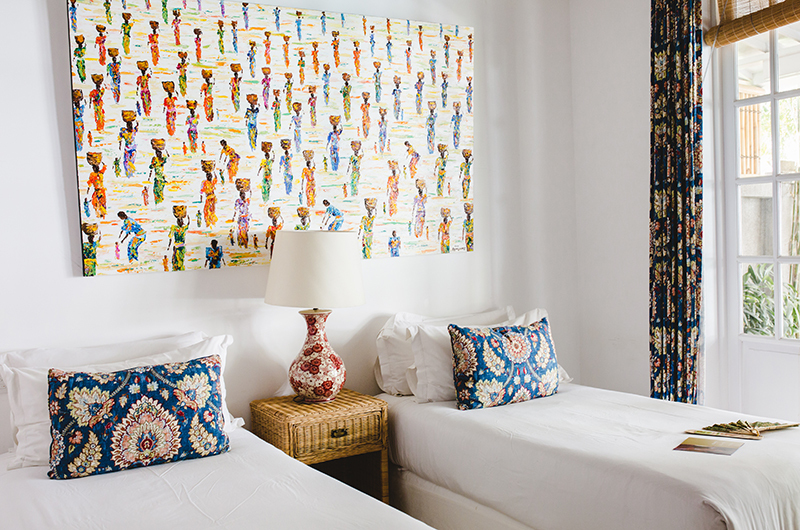 The rooms each have a welcoming aura whenever you step into them, and the beds are big and way too comfortable promising you a peaceful snooze every night. 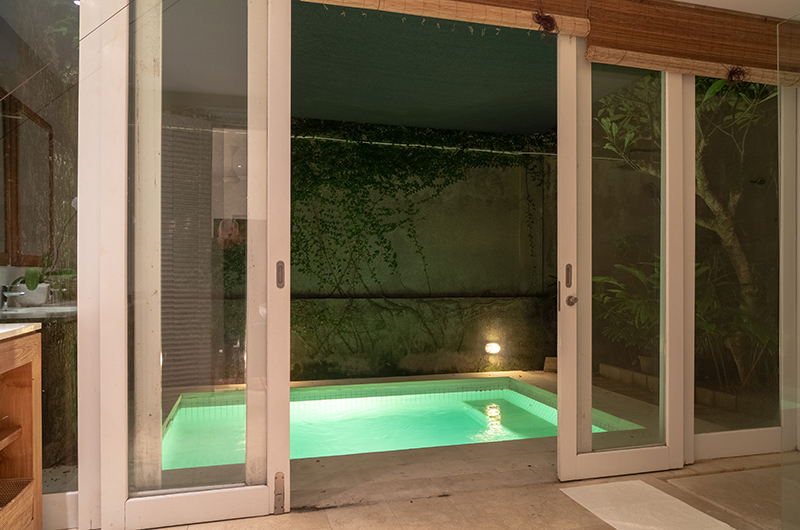 Tucked away from all the chaos just in Seminyak, this holiday villa adds calmness if you want that or if you are looking out for bars/restaurants at night you can just walk. Everything here is great! What a great villa! Amazing property with designer-feel to it. One of the bathrooms, even had an antique rocking horse in it! We played pool, went swimming, ate like kings. You don’t have to even go out the front door for the whole trip if you don’t want to! Thank you so much for such a wonderful time in Bali, The Cotton House is simply beautiful and we felt like we had our own piece of paradise for a few days. The Cotton House is one of those places where as soon as you walk-in you can’t wipe the smile off your face that this is your holiday home until you might burst into tears when having to leave! 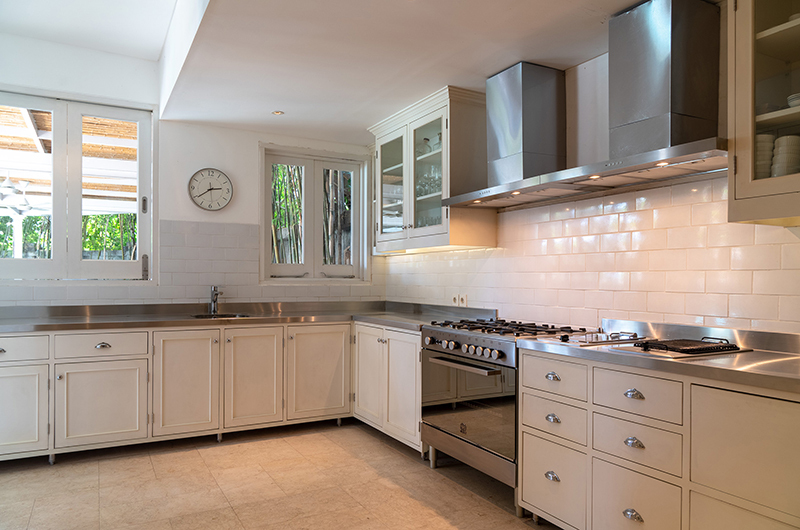 Everything about this property is done with aplomb and total attention to each little detail. From the wide open (massive!) lawn area and cool-looking pool with water toys, the several different pavilions of white housing all with modern design yet adorned with unique furnishings and artwork to still give it that “warm” feeling, the pool table, the separate 2-storey house (that I managed to nab first with my partner), air-conditioned gym, I could go on. Each room had its own vibe. You can tell that not only is this an amazing place to rent for guests, but that it is also deeply loved by the owners. The staff are incredible – smiles, and preempting questions or assisting with anything needed. And the chef is simply world-class. We had a LARGE diverse group of different (or should I say fussy?) tastes from India, Indonesia, Singapore and Japan, and all our requests were taken into account resulting in delicious meals every time. Up the road from Seminyak Square, it has to be one of the largest places available in the area. It is a Must-book. You will not be disappointed. This Cotton House was the best setting ever for our company trip to Bali. 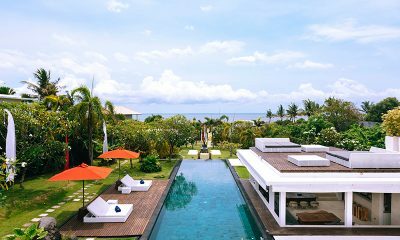 Located in Seminyak this villa is close to all the restaurants, super markets, ATM’s, beaches and nightclubs. When I walked into the villa for the first time the overall layout and design made me feel very welcomed. The villa staff will attend to all your requests and will make sure your stay is pleasant. The villa chef really knows how to cook. We had our global company dinner in the villa and all our staff food choices (or I would rather say habits!) were different but the chef did a great job of cooking different varieties, which catered to everyone’s preferences. 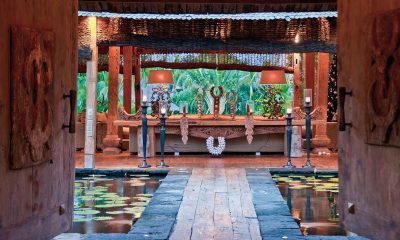 The overall stay experience was great and would like to stay in this villa again when I come back to Bali next time. 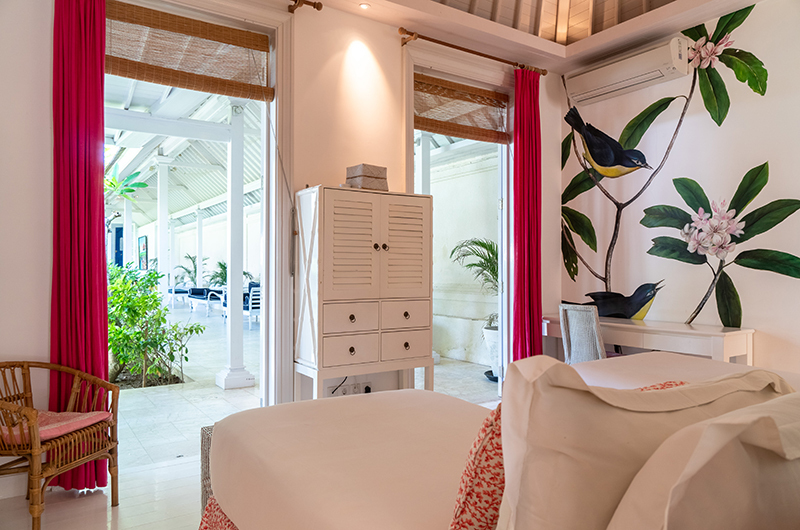 The Cotton House is a white palatial villa in the heart of Seminyak, walking distance to Eat Street and major shopping areas. On entering this villa, I was greeted by the manager who was present and actually had the owner’s two little cute fur babies, the dogs Franky and Milly, with them. They are not there all of the time, and can be taken away, but I was glad they were because to be honest I spent a lot of my time just playing with them during my entire stay! This 7 bedroom villa seems straight out of a home design magazine and it was tough to decide which bedroom to choose! We had an extravagant feast at the posh living and dining area, thanks to the villa chef for the delicious food. The villa also has a fully equipped gym for those who love to stay fit on holiday. I loved the in-villa massages and mani-pedi’s by the pool. Enjoying drinks on the sun loungers, playing with Franky and Milly in the lush gardens and watching movies in the stylish media room, that’s how I spent my days at The Cotton House. Would definitely love to go back. Entering the villa, you will definitely say WOW! It has a cool swimming pool in the middle of the courtyard garden, and plenty of lawn for playing if you have kids ora large family (you will end up spending a lot of time in the open-air enjoying outdoor activities before jumping in the water)! There is a gym situated at one side, totally equipped with all the machines you could need and a good amount of space. I loved the room arrangements, all very large and each different in their interconnected wings in the main pavilion, then there is another standalone building with 2 more bedrooms (wow again)! Villa staff are very courteous and helpful, and villa is very secure. 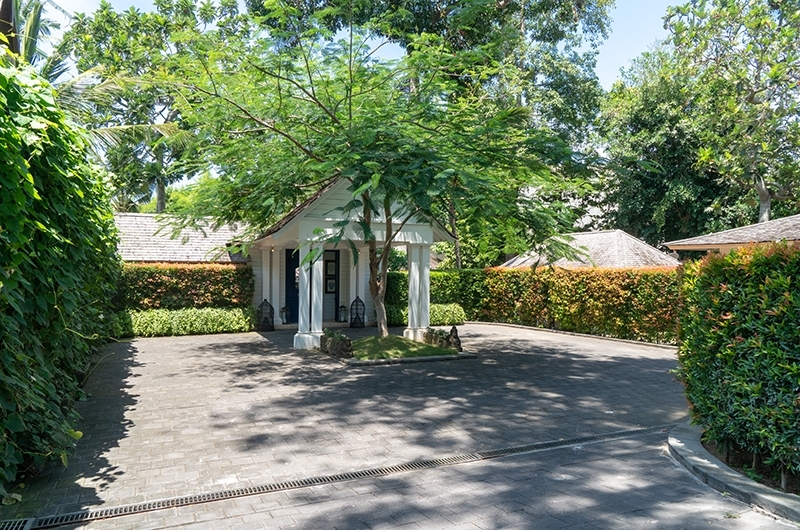 It is situated up from the Seminyak Sq but at a very peaceful driveway location down from the main road. Property is very well maintained. Loved it! The chef is a gem and knows how to cook. Breakfast was perfect! Exactly how we like it. We had a special dinner for the Ministry of Villas team and the chef was cooking all day making everything from scratch and it was the best food we had while in Bali. I can’t say enough about the staff. They are all so lovely and even though there is a large team they are not intrusive and in your way. They allow you to enjoy the privacy of a villa but there if you need anything. The internet was fantastic! There was over 10 of us online and it never dropped out so perfect for a retreat where you need to be online or a business team building getaway. The bedrooms are all spacious so there is no need to fight over bedrooms. The bathrooms are great and I love the shampoo and conditioner added for guests. 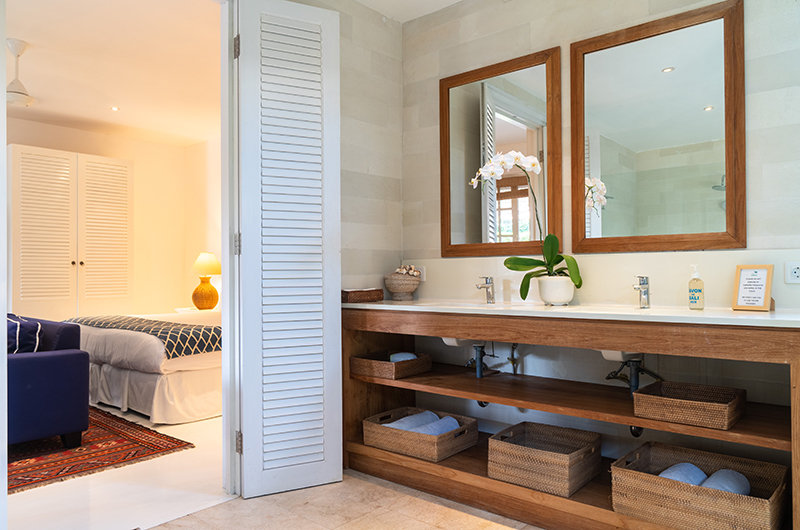 The fresh white towels are wonderful as many villas do not replace these regularly and we all know what happens to white towels in Bali. The villa also has two cute little puppies that can stay at the villa or be taken away. The dogs (Milly & Franky) could have been the most popular attraction of the villa. The team absolutely loved having them around and they are super cute. We also love the fact the villa can host events for an additional $25 charge per person. So it’s perfect for weddings, birthdays or hen’s night. 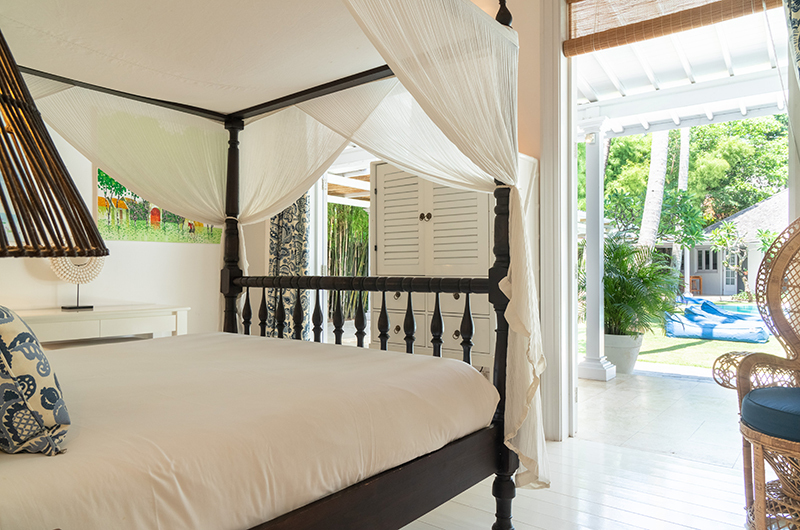 Our staff fell in love with this villa so we highly recommend it. Contact Ministry of Villas to book today. 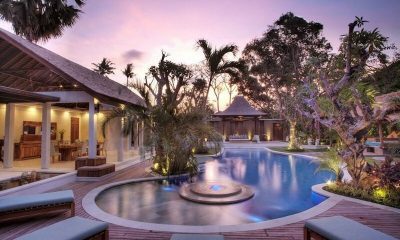 I had the pleasure to stay at The Cotton House with all my team mates to enjoy this seven bedroom villa right in Seminyak. The pool is quite big and it has a beautiful living room with a pool table, gym, and lots of outdoors. I liked the location of the villa, and I had an in-house spa session which was very refreshing. I also liked the interior and paintings everywhere in the property. 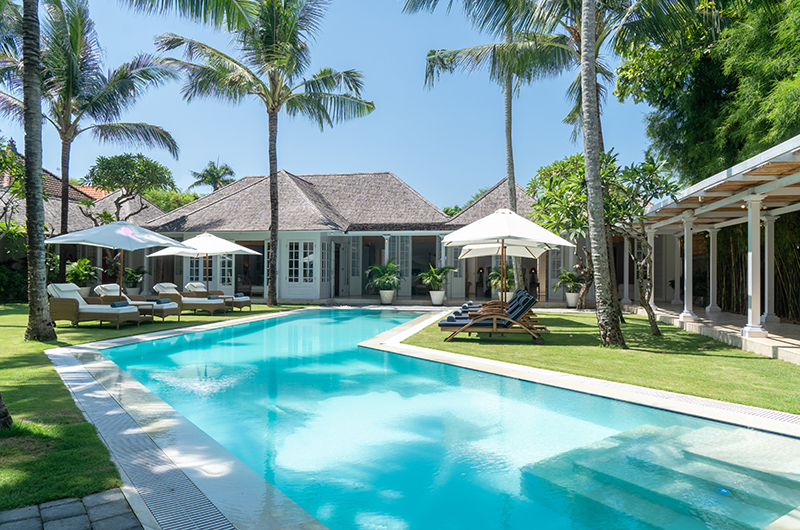 The Cotton House has got to be one of the best villas in Bali… would recommend staying in it if you can. I stayed in The Cotton House for several nights with a large group, and it couldn’t be more perfect to cater for our needs. All 7 bedrooms have different themes, and I especially liked the kid’s bedroom that is very nicely decorated and sits just next to the huge master bedroom (which incidentally comes complete with the biggest ensuite bathroom and walk-in wardrobe I have ever seen!) and which has fun aspects like a rocking horse in the bathroom and huge antique cow skull sculpture. 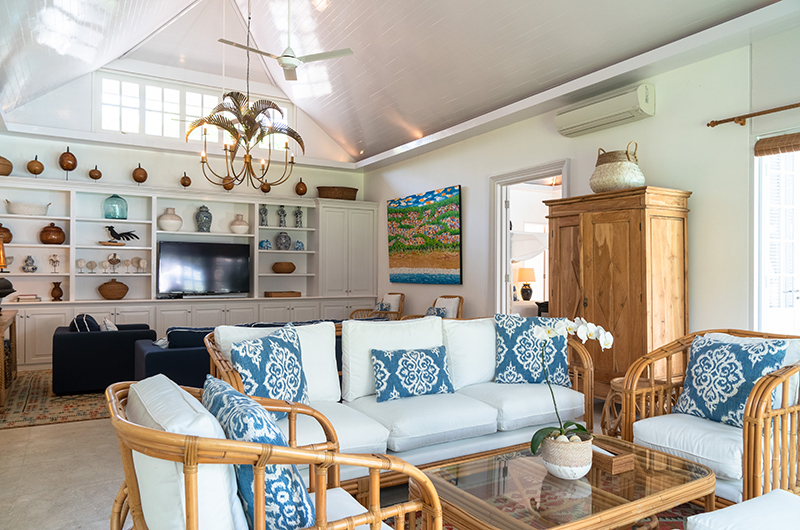 All areas of this villa were made so decorative and with attention to the art and antique-type furniture that just WOW’s you, and adds major fun vibes and atmosphere in the living area and the study room. The pool is amazing and then it even looks like a piece of art itself in the evening as it lights up and has a complete perfect blue shine to it. The location was nearby for us to go shopping and then a drink (we went to La Favela which was great!) after the delicious meal served to all of us by the live-in chef. All the staff also were very good and helped us get a cab and organise to hike Mt Batur early in the morning. Over all, it’s a perfect villa to stay in with a group of friends or a large family (I think next time I must bring my parents and grandparents as well!). Its easy to see why The Cotton House is a hit with everyone who steps through its doors. 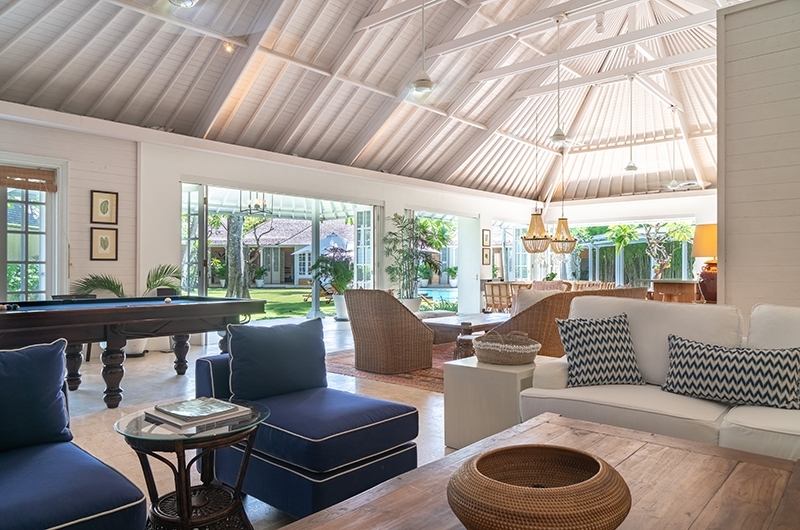 The property is definitely a gem in the middle of Seminyak – located just minutes away from Eat Street and famous bars / clubs like La Favela, Ku De Ta. ATMs and convenience stores are nearby and taxis are aplenty should you need one. When you walk into the property, its tough to decide which bedroom to sleep in as all of them are equally alluring. The master bedroom benefits from a large walk in wardrobe and shower space. The separate pavilion that stands on its own, away from the main living area is another private corner for families or friends to congregate. The food is very tasty – would highly recommend the beef rendang and the chicken noodles with soup (something like mee soto). From the moment I walked through the doors I was in awe! On first impressions I thought I was walking through a celebrity residence – not only that but I was treated like one throughout the entire length of stay. 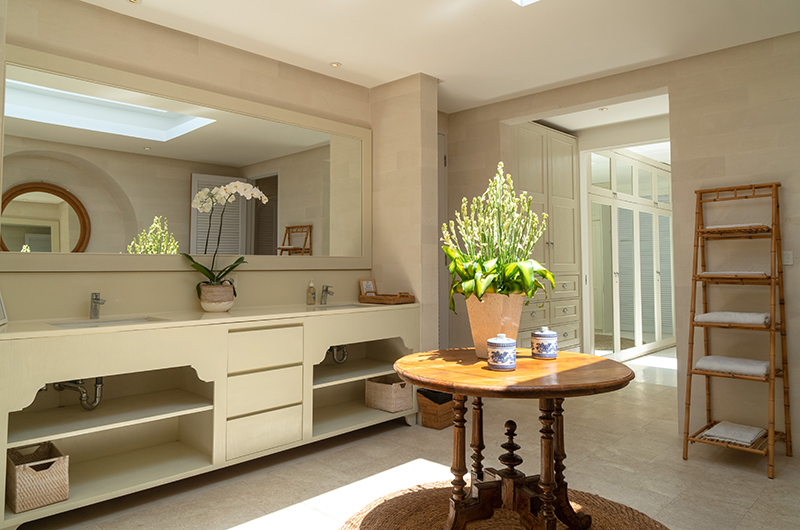 The Villa, was spotless and cleaned daily and there was never anything out of place. Even the gardener was enjoying life! You could see why! Situated close to the main street, it made travelling around Bali even more relaxing and enjoyable. Highly recommend staying here for your next Bali vacation. Great job to Mel and all your lovely staff. Hope to be back soon!